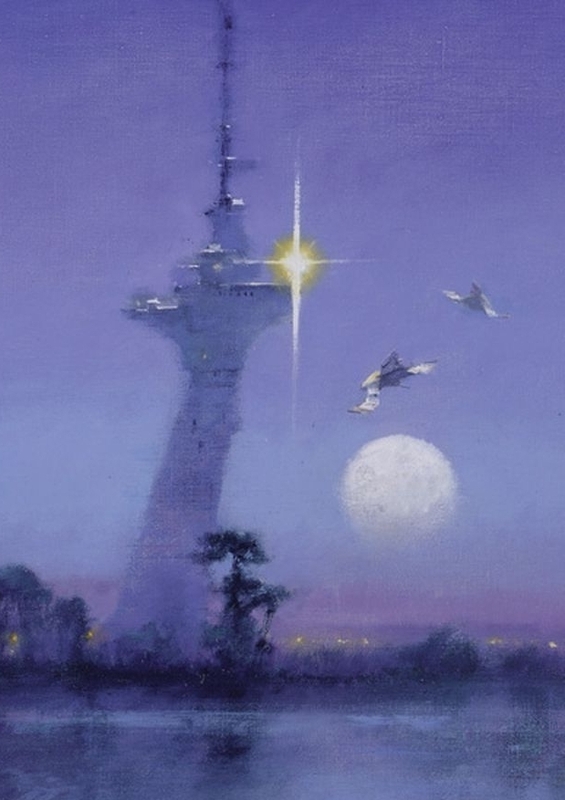 I based my concept heavily on various works of art painted by John Harris. He does a very good job of communicating scale in his paintings and that was something that I wanted to try to take on for myself. The two main elements I used within my project were Height Fields and the Copy Stamp node. I first started by creating the terrain preset of Dunes. It starts with multiple height field patterns set to ramp and has the ramp remapping adjusted to look similar to a sand dune. I then edited the initial settings of the preset dune to get to a look that was more like I wanted. Then I added my own height field pattern ramp to add a ridge that cross the image and merged it together through height field layer. I used the ridge for the basis of the placement of the towers. I created the mountains in the background by creating two different height field patterns and combined them with the height field layer using difference. I then added more detail and positioned them into that place I wanted and merged it into the larger height field. Finally I finished it off with the erode node to get the final result. This is the entirety of my Height Field Network. Additionally I created a cop network to adjust the masks and layers created by the erode node to get the textures used in the final render. 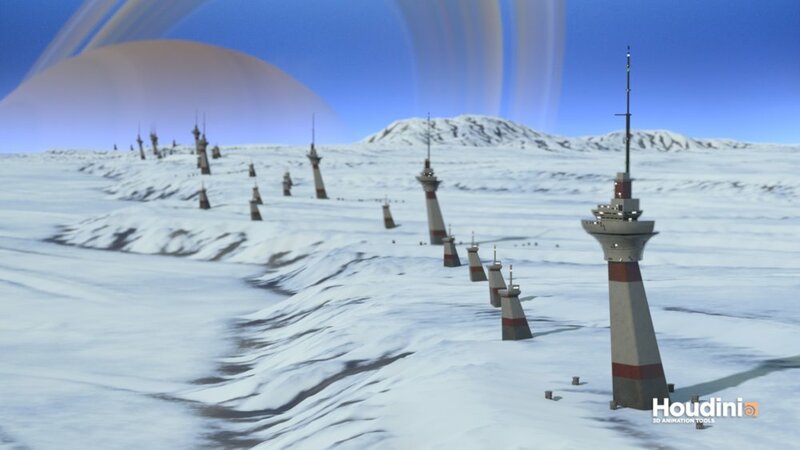 I modeled three different tower like structures based on some of the original paintings by John Harris. Then I exported the final geometry and brought them into Substance Painter texture paint them. Once I had the final objects I created a curve that matched the ramp/ridge that I added to the height field. I re-sampled the curve to the desired number of points and then projected the curve on to the surface of the height field using a ray. Once I had that I used the projected curve to determine the location of the towers. I also used the Copy Stamp to stamp a random rotation of roughly 40 degrees to make each towers not be perfectly placed along the lines. I also setup two separate copy stamps so that I could use the same curve but have them be spaced out based on a set parameter skipping every so many determined by said parameter. Additionally I painted a small mask around some of the large towers on the height field and then scattered points on to it to create more smaller towers to help to add to the overall scale. The scene is render with Houdini’s environment light, and Mantra Physically Based Renderer.